← Spiraling out of control! 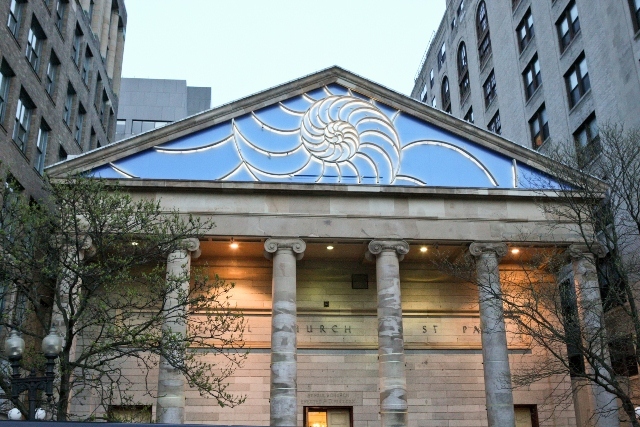 There was a lot of reaction and (mostly) thoughtful commentary after I posted my response (The Heart of the Nautilus) to the new artwork on the pediment of the Cathedral of St. Paul in Boston. Since then I’ve been in contact with the cathedral’s gracious dean, the Very Rev. Jep Streit, who naturally doesn’t share my opinion on this. I very much appreciate the thoughtful critique Tim wrote in his blog about our new nautilus pediment. I love his list of what he seeks in a cathedral. “Amen” to that list. I’m grateful for his generous offer to respond to his posting as a “guest blogger” on his site, which only underscores my appreciation of how he engenders reflection and discussion in a thoughtful way. In our video the artist remarked that he wanted to create art for the pediment that was not “too religious,” which of course alarmed some people, as though he were articulating our new mission statement. Remember, he’s the artist, not the Dean. I simply thought he was trying to articulate, in his imperfect way, his experience of the Cathedral as a place with an expansive vision of God, “not just for Episcopals” as he put it, and so he attempted to create something that would be broadly inviting. At St. Paul’s Cathedral we celebrate the Eucharist eight times a week, keep our church open all day for anyone to come in and pray, hold a weekly meditation group and have welcomed and fed hungry people every single Monday for thirty years. I don’t worry that we aren’t Christian enough. After two millennia the cross is now an unmistakable symbol of Christianity, it’s something everyone expects to see on a church. But isn’t God the One who surpasses our expectations, not the One who just meets them? Isaiah proclaimed, “Behold, I am doing a new thing.” Is it unfaithful to imagine a new symbol for our faith? It may not be immediately clear exactly what a nautilus atop a cathedral means, but that ambiguity can invite thinking and conversation, much more than if we had done something less provocative, as evidenced by all the responses to Tim’s blog. A nautilus is ancient (half a billion years old), just as our faith has ancient roots and traditions. Both the nautilus and our faith are open-ended, ever-expanding. A nautilus grows by forming new chambers is it outgrows old ones, it can never go back, just as the God leads us on our faith journey into new places, deepening our conversation. The Holy Spirit is dynamic, not static. The spiral of the nautilus shell is universal, an elemental form found throughout creation, from galaxies to weather patterns to the growth of plants to sub-atomic particles, just as we believe God is universal and unlimited. Jesus gathered disciples by inviting people who were curious about him and what he was doing. “Come and see,” he told Andrew, who then brought his brother Simon. My hope is that our nautilus sparks curiosity and welcomes exploration. The nautilus works (or perhaps doesn’t work) as a symbol on these and many levels, but for me it is beautiful and inviting. I love it, and I think it does not require an explanation to be appreciated. Of course everyone doesn’t agree with me: one man’s beauty is another man’s fish house. The week after the official dedication of the nautilus I received the following email from a total stranger. In it she confirmed my hope that our new artwork would be engaging and inviting to people who might not otherwise care or even be aware of St. Paul’s and our ministries, and she offers her own reason why the nautilus is a good fit for our cathedral. I read about the inspiration of the Holmes poem, but I want to comment also (surely I am not the first) that the nautilus’s many ‘rooms’ evoked John 14:2. As I read about the multi-faith ‘homes’ provided by the Cathedral, not to mention room for the ‘homeless;’ whose room has been on your porch for many years, the verse echoed in my mind. I am not Christian, but I am a great appreciator of this new and marvelous work. But when all is said and done, what is true is simple: our ministry is our message. I’m proud of our ministry, the gospel witness we make every day. I’m also glad for the conversation we are having about our new façade. Of course there are many viewpoints, just as in God’s house there are many rooms. Sorry–I find this reponse absurd. The big red-flag word was “alarmed,” as if the laity were a bunch of old biddies in hysterics over the new-fangled automobile. I’m alarmed at the high degree of possibility of being condemned to Hell when I die. As a Christian, I do not believe in the power of the Ancient Nautilus to save me. Is that OK? While I don’t have a problem with the Nautilus, I do think it kind of looks more like the entrance to an Aquarium or Museum. Which may be a great way to get them in the door. “No it is not the Boston Aquarium, but would you like to learn to fish for people?” Seems to me I have heard that somewhere before. If the nautalis were the symbol of our faith, then what is our faith about? Oh, I think the nautilus is lovely. I saw it and immediately thought of baptism. I also think the image is more interesting than another cross (which, quite frankly, I think we see too often in churches), or certainly than an image of St. Paul. In addition to baptism, it called to mind the first apostles, stories of fish/fisherman, parting of waters, etc. It’s different, interesting, and dynamic. Kudos. I still don’t know what a Nautilus is…. The cross is not the only symbol of our faith. At various points in the history of Christianity the fish, the pelican, the star, the lamb, the anchor, the dolphin, the crown, and more have all served as symbols of the faith. They became associated with the faith because people saw in them a connection with their understanding of the faith–the faith did not create the symbol. The nautilus isn’t THE symbol of our faith, but I see no reason why it couldn’t be A symbol, if used and explained well. It certainly doesn’t replace the cross. Even so, no matter the symbol, the symbol does not save. God saves. If you are hoping that the mere symbol of the cross, or any other symbol, holds your salvation, you are misinterpreting the symbol. While the nautilus tympanum does not tickle my aesthetic fancy, at least they didn’t decide to recreate a slavish imitation of a church like St. Gregorius Church in Aachen, Germany — or as I like to call it the Church of Holy Hoover Dam. Now, I usually take a relatively relaxed stance toward “modern” church architecture. Some of it is simply atrocious, yes, but while I am a little less forgiving when talking about a new construction church, which one would think should have more permanence that a strip mall or a development of cookie-cutter townhouses, I perfectly happy to concede that there are some beautiful modern churches which evoke the very values and spiritual dispositions that any good architecture should. My wife is an interior architect, so I am not unfamiliar with the deep psychological manipulation intended by architects when they design a building or a space, one needn’t build neo-neo-gothic or neo-neo-classical or neo-neo-whatever-that-is-the-papists-used-to-like to achieve an positive effect. 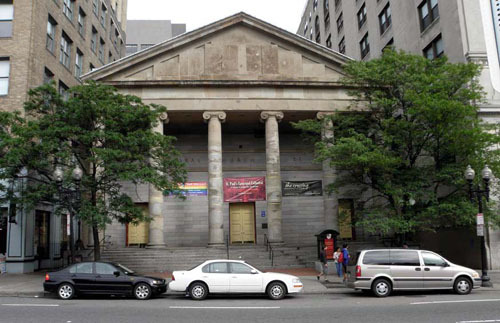 That said, usually when it comes to renovating a historic church, I would prefer nine times out of ten that the planners avoid wreckovating it. “Please, please, please, do not destroy the architectural integrity of that building, please,” is my usual appeal, albeit usually not aloud. Again, that said, this isn’t too awfully bad. The nautilus has a more recognizable symbolism in it than much of the simply quacky stuff that passes for religious art these days. The Holmes connection, while rarefied and a little snobbish, does make this a celebration of Bostonian history and culture, although I much prefer Oliver at the Breakfast-Table to Wendell the werse-witer. Also, as a Greek Revival building, drawing symbolic value from something whose form inspired classical architects in distant antiquity makes some sort of sense… I think. Dean Streit’s response is also easy to sympathize with. At the very least, he is not wrong. Furthermore, I very much respect his willingness to engage with the criticism without a heavy-handed nastiness that is equally dismissive. Even more important than all that might be wrong with this tympanum is that frankly, anything, even this, looks better than the former featureless facade. Including the photograph of the church before it became Joe’s Crab Shack was critical… All of sudden I felt as if the weird shell looked gloriously beautiful in contrast to the sheer ugliness of the discolored, flat, characterless triangle of prison-like bleakness… I am not from Boston, but my immediate response was, “that looks like an oppressive, windowless wall facing some narrow alley in the worst story you can imagine of the poorest, most impoverished child ever spurted out of Dicken’s pen.” It doesn’t look like a bank, it looks like an abandoned building that had all the shiny bits salvaged and auctioned off. Yes, they could have put Paul and Agrippa and been true to the spirit of the architecture itself, but honestly it would have been a exorbitantly expensive bas-relief that passerby would look right through it and never notice, like almost ever other bas-relief on every other piece of neoclassical architecture on the eastern seaboard. We should be proud of our faith in many ways, but that doesn’t mean we have to be blind to how the symbols which yield so readily to us, the initiated, evoke an entirely different, mostly negative, response in those that most need to hear the good news. Did they accomplish this with the delicious-looking, neon seafood sign? Probably not. On the other hand, Dan Brown would be proud! We can now begin plumbing the super-secret-sacred gnostic code suggested by the nautilus’ divine mathematics and also how the interior of the cathedral is actually an astronomical map designed by the Scottish Freemason Episcopalian founders of the parish, which will then direct us to the exact location of St. Paul’s final resting place on the outskirts of Boston, which will further reveal to us the lost tale of how St. Paul travelled to the United States, right after he left Glastonbury, and preached the gospel to the Native Americans but was ultimately stricken down by a diseased bit of underdone codfish. Of course, his martyrdom as we know it would therefore be proven apocryphal, but who wouldn’t blame the churches of the Mediterranean for inventing a noble death when they honestly had no idea where their great leader had buggered off to? Now that’s a sin for which boomers will actually have to answer. 😛 The sin that I have to answer for will be the of sin prolixity and discursiveness and why am I up 1:14 responding to blog posts. Barbara, read the Wikipedia article on this. It’s quite fascinating. I think it interesting that the nautilus grows ever-larger chambers in its lifetime, each attached to the last in a well-ordered spiral. In the Epiphany season we experience the ever-growing understanding of our Lord, not letting go of our past experiences. However, I don’t think this blue-backed representation is an asset to this building. It might have worked better in stained glass, even if back-lit. What a fine reply by the Dean. It makes me grateful to be Episcopalian and to be living in these times in which Christianity is increasingly embracing the spaciousness of God. Many of the comments are very fine too. I hope no one is advocating going around to all the Episcopal churches with pelicans in the windows and chipping those out. Also, this additional symbol in Boston was not installed while removing all crosses or references to the cross from the Cathedral and its liturgical life. God was speaking before the Christian religion – and not in the limited patterns of conventional religion. Perhaps we are gradually awakening to this ongoing reality.